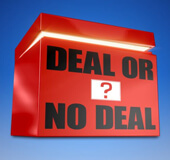 Deal or No Deal Slots - Beat the banker & get CASH! Step 1 – Decide how much you want to bet (5p, 10p, 20p). Step 2 – Click the “START” button and begin to spin. Step 3 – Open the cases for Token prizes. If you love the TV sensation then you'll love this. 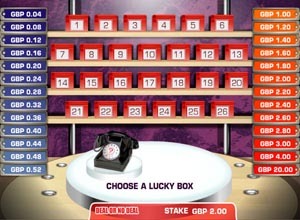 To win this slot game you need to match the symbols on any of the 20 pay lines. The famous ‘Banker' does arise though to offer you a deal before you spin. Take the offer and lose a spin or just go for it! There are the usual 5 reels, 20 pay lines and a Wild DOND Red Box Symbol. This slot has so much variety and it's really simple to play, just choose a level to play (0.05p, 0.10p and 0.20p) and have a spin to see if you win. Remember though, the Banker isn't always as nice as he seems.